This is what Saudi Crown Prince Mohammed bin Salman told Bloomberg News following last month’s murder of journalist Jamal Khashoggi. Prince Mohammed, alongside his brother, who serves as the Saudi Ambassador to Washington, stood by their stance that it was a rogue operation that led to Khashoggi’s disappearance. But on Nov. 16, the C.I.A. concluded that Prince Mohammed, with the assistance of other Saudi officials, orchestrated the murder after obtaining intercepts of the crown prince’s calls in the days before the killing and calls by the kill team to a senior aide to the crown prince. In the call coming from the kill team, a recording which was shared with C.I.A. director Gina Haspel, the caller can be heard saying “tell your boss” to the senior aide. The “boss” is believed to be Prince Mohammed because the C.I.A. 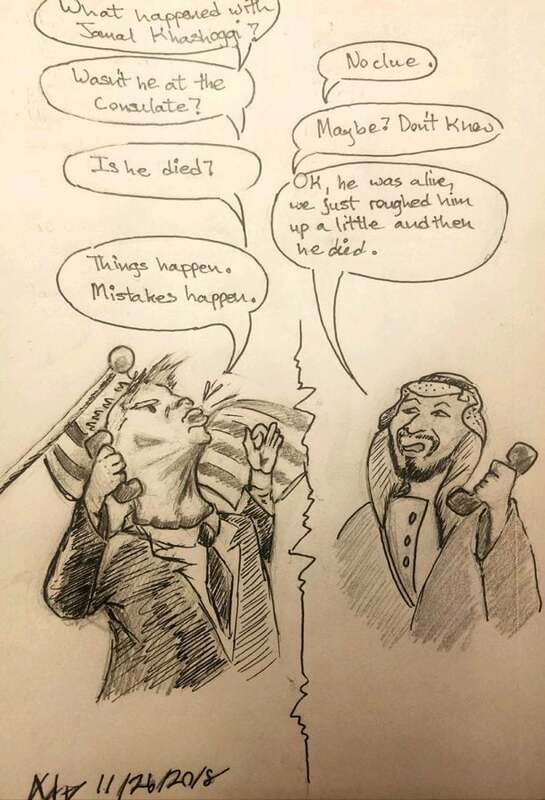 operated under the impression that the killing at the consulate would not have taken place without his approval based on the influence the 33-year old prince has over Saudi Arabia. Originally, a Saudi official told Reuters news agency that Khashoggi had died after resisting multiple attempts to have him return to Saudi Arabia in a chokehold. The official said Khashoggi’s body was rolled in a rug and given to a “local co-operator” to be disposed. A Saudi operative then donned his clothes and left the premises. According to the Committee to Protect Journalists (CPJ), 30 journalists have been killed in 2018 with a confirmed motive. Like Khashoggi, many of these journalists were slain in the Middle East, bringing global freedom of press back to the spotlight. Guilford students noted concerns with these attacks because of how they obscure the truth. “When the government controls what is said and what is shared, they control the truth,” said sophomore Wesley Roberson. Junior Morgan Tompkins highlighted the importance of relaying accurate news to the public. In the same CPJ report, it showed 47 journalists have died in total in 2018, whether from crossfire in combat, being on a dangerous assignment, or being murdered. Senior Darrious Patterson emphasized the dangers of being a journalist in general. President Donald Trump’s administration had previously been seeking to resuscitate the relationship between Washington and Riyadh, which has been central to its strategy in the Middle East. However, Republican chairman of the Senate Foreign Relations Committee Bob Corker declared that the U.S. should impose sanctions on Saudi Arabia if Khashoggi has indeed been murdered. On Nov. 28, the Senate voted 63-37 to move forward with legislation that called for the end of U.S. involvement in the Suadi-led war in Yemen, according to AP News. Despite the evidence of Saudi Arabia’s involvement in the death of Khashoggi, the Trump administration has continued to defend and maintain the innocence of Saudi Arabia and Prince Mohammed.